Welcome to 2018! and Day #13 of Chocolate, Holiday Spices and Maple Theme Week. This fancy, Chocolate Pillow dessert was purchased on a sunny winter day at Alexander's Patisserie (Mountain View, CA). Filled with light, airy chocolate mousse, this Valrhona*-based chocolate dessert was luxurious and delicious. The dark chocolate mousse-filled "pillow" was resting on what appeared to be a caramelized chocolate rice cake bed, and was topped with a small, thin chocolate square. 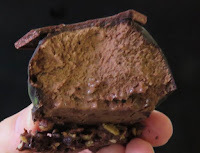 Aside from a light touch of nutty/hazelnut flavor in a few bites and crispy texture of the base, this was all decadent, velvety chocolate. Meanwhile, up North people are getting ready for the February-March maple season. 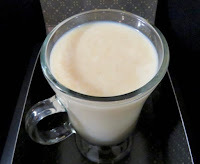 I raised my glass to these winter harvesters, as I poured a small drizzle of maple syrup into a hot spiced chai tea. 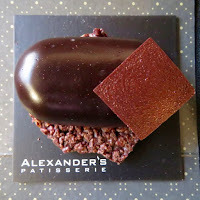 *Alexander's Patisserie uses Valrhona (French) chocolate for almost all their chocolates and chocolate-based desserts.